Command of Combined Task Force (CTF) 152 today passed from Kuwait to Bahrain at a ceremony at the Royal Bahrain Naval Base. 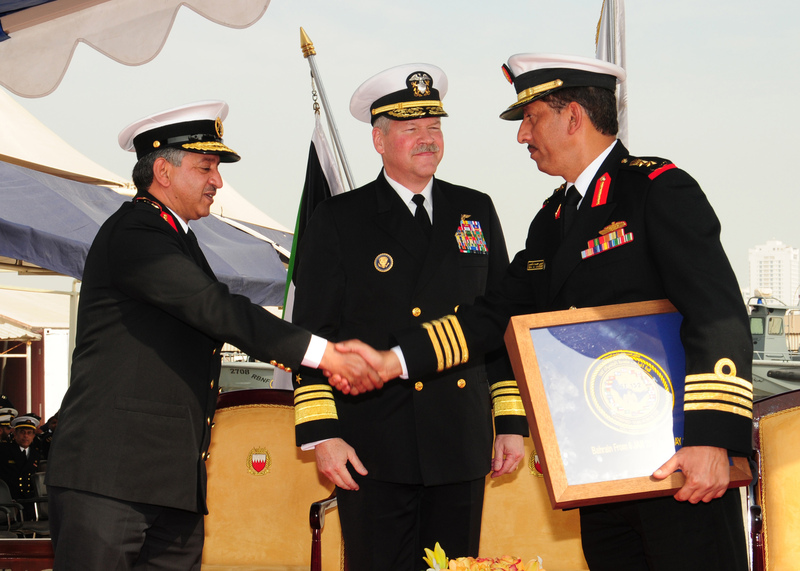 Brigadier General Jassim al Ansari of the Kuwait Naval Force was succeeded as commander by Colonel Isa Al Doseri of the Royal Bahrain Naval Force. CTF 152 operates in the Arabian Gulf conducting maritime security operations in conjunction with regional partners to prevent destabilising activities and promote maritime security for the benefit of all. Activities conducted by the task force include counter terrorism, maritime infrastructure protection and regional engagement of maritime partners. Kuwait assumed command of CTF 152 from the United Arab Emirates on May 9, 2010. For part of Kuwait’s command period, CTF 152 was also commanded by Colonel Abdullah Dashti. The rotation enabled two senior officers to gain valuable experience of leading a multi-national task force. In addition to daily Maritime Security Operations throughout the Arabian Gulf, three large-scale evolutions were held during Kuwait’s command period, with the aim of enhancing command and control capabilities, improving combined planning processes and increasing cooperation among regional nations and international partners. These were: Stakenet, which focused on the protection of maritime infrastructure; Goalkeeper, which aimed to improve rapid information flow between different Naval Operational Centres; and Khaleje Response, which sought to coordinate host country, coalition and U.S. capabilities in response to natural or manmade crisis and events, including medical trauma at sea, collisions, and oil spills. CTF 152 is a multi-national task force which has included participation from Kuwait, Bahrain, United Arab Emirates, France, New Zealand, Italy, Australia, the United Kingdom and United States. promoting a safe maritime environment.